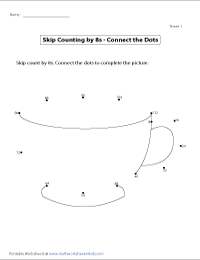 This page comprises of skip count by 8s worksheets. 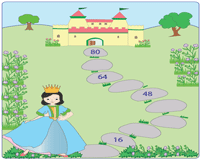 This includes number line, counting with pictures, complete the path, maze and connect the dots worksheets. Teacher templates are available. The display charts are used to introduce skip counting by 8s to the students. Partially filled charts and blank charts are used to test the skip counting skills. 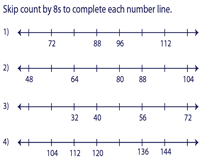 Implement the display charts to help children skip count by 8s in the reverse order. Employ the partially filled and blank charts to practice skip counting. Number line is given in multiples of eight. 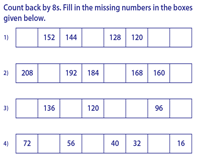 The students have to skip count by 8s to fill in the missing blanks. 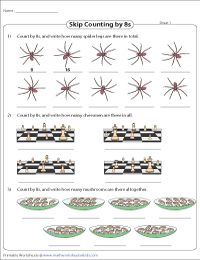 Children understand the concept when it is explained with an illustration. Skip count by 8s to find the total. Linda and Sally need guidance to reach the castle and mermaid respectively. Count in 8s to complete the path. 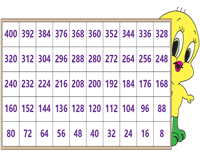 Templates are also available where the teacher can fill in the numbers of their choice. 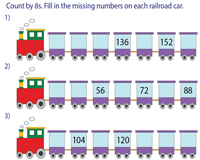 Count by 8s to find the missing numbers on the railroad car. There are five problems in each worksheet. 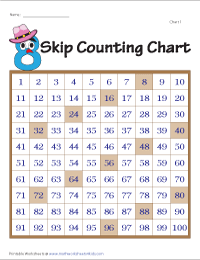 Skip count by 8s to find the missing numbers. There are six problems in each worksheet. Children count backwards with ease after they have become proficient in counting forward. 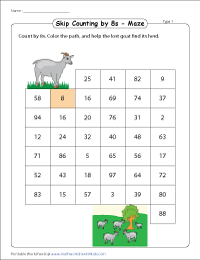 Color the path by counting in 8s to solve each maze. 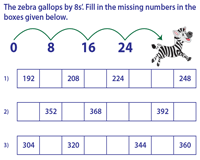 Employ these worksheets to hone your skills in skip counting. Join the dots to complete the picture. The dots are given in multiples of 8. Have fun!